Series L8 Flotect® Liquid Level Switch features a leak proof body and float constructed from tough, durable polyphenylene sulfide which has excellent chemical resistance. Because the liquid level snap switch is magnetically actuated, there is no direct mechanical linkage to leak or fail, assuring longer life and decreased maintenance costs. This inexpensive unit is ideal for liquid level alarm, indication or control. Installation is quick and easy - simply install in a horizontal position with the index arrow pointing down. The L8 Flotect® Liquid Level Control is UL recognized as an industrial motor controller per UL standard 508, suitable for mounting in a protected environment. This lightweight switch can be used in numerous chemical processes, industrial systems and similar applications where process conditions are compatible with polyphenylene sulfide, ceramic 8 and 316 stainless steel. 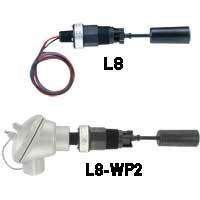 This liquid level switch provides accurate setpoint control of liquids with specific gravities as low as 0.6. This compact and reliable control is designed to handle temperatures up to 212°F (100°C) and pressures to 150 psig (10 bar). Wetted Materials: Float and Body: Polyphenylene Sulfide (PPS); Pin and Spring: 316 SS or Inconel® Alloy; Magnet: Ceramic 8. Pressure Limit: 150 psig (10.34 bar). Enclosure Rating: General purpose. WP/WP2 options are weatherproof. Switch Type: SPDT snap switch. MV option is a SPDT gold contact snap switch. Electrical Ratings: 5A @ 125/250 VAC, 5A resistive, 3A inductive @ 30 VDC. MV option: 1A @ 125 VAC, 1A resistive, 0.5A inductive @ 30 VDC. Conduit Connection: 1/2" male NPT, 1/2" female NPT on WP and WP2. Process Connection: 1" male NPT. Weight: 5 oz (142 g). Agency Approvals: CE, UL 508 for US and Canada.